Anaheim 1 provided plenty of surprises. Here are Grant's picks for the full performance spectrum. After dealing with major injuries in his first two years with Star Racing Yamaha, Colt Nichols finally made it through an offseason injury-free and came into the 2019 season in the best shape he has been in since 2016, which was a pretty good year for him with Rock River Yamaha. I gotta say, though, I didn't expect for him to run away with the win at the first round by a margin of 16 seconds. Top five? Absolutely. Top three? Wouldn't be surprised. But a dominant win, in which he led every lap? I wouldn't have put money down on that kind of result. He did it, though. He got a great start, put himself in the lead quickly, and rode the slick and somewhat muddy Anaheim track as if it was dry. He was still hitting all of the big lines from the looks of it, but he didn't look sketchy while doing it and never made any major mistakes. The lap times reflect that, too, as the only rider that was really even close to him in lap time consistency was his teammate, Dylan Ferrandis. Unfortunately for Colt, some people are going to see this as a fluke because of the weather. They're going to want to see him dominate again next week in dry conditions to prove that he deserves to be in the championship conversation. I wouldn't think he will be too worried about that, though, because his confidence seems to be at an all-time high. Plus, Colt seems like a pretty laid-back dude...so I doubt he really cares about whether people see his first win as legit or not. The bonus check will still clear, and he'll still show up next week with red plates on his bike. Canada's most promising 250 rider, Jess Pettis, is back this year to race some more Supercross. He's got a new team, though, with Red Bull / Thor KTM (the factory KTM team up in Canada), and he looks way better than he did last year. It was clear that he had potential when he showed up in 2018 on his MX101 Yamaha. The speed was there, but he also dealt with a lot of bad luck and quite a few crashes and mistakes. This year he looks much more calculated and comfortable. He took care of business in qualifying and was always at the top of the board in the B Group, and then he qualified straight through to the Main Event from his heat race. From there, he got a midpack start and battled around the top ten all race long before finishing in tenth place. That's a very solid start to the season for him. I'm not sure if he's racing the entire series or just select rounds, but he'll definitely be one to watch as we go forward. 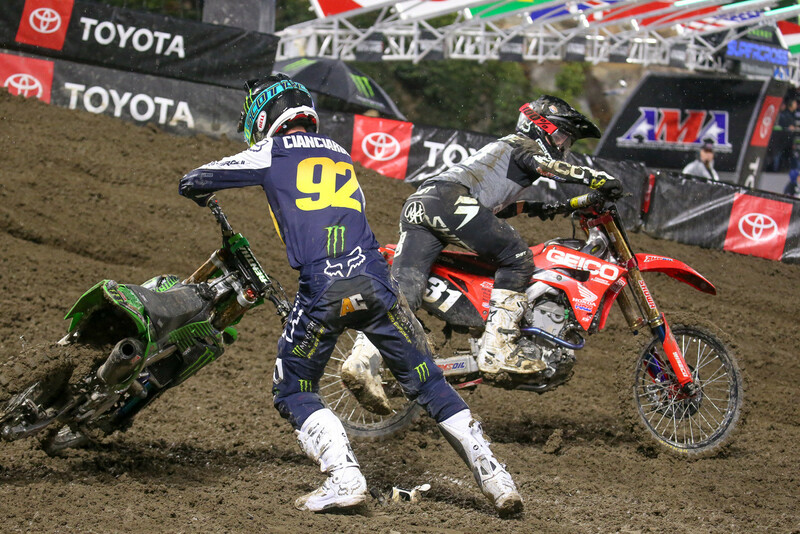 That...was an interesting Main Event for Adam Cianciarulo. Of course, that term could be used to describe a lot of his Main Events these past couple of years, but it's been a while since I've seen a rider go through so many phases of being in control and out of control in one race. There were times where he looked like the fastest guy out there by a mile and also one of the most in control, and then he'd look completely out of control and was carelessly sending it in some of the rhythm sections. He was still catching the guys in front of him, though, and at one point he parked RJ Hampshire and took over fourth place before one of the whoop sections. He then had fourth place secured for all of two seconds before Hampshire came flying in underneath him as they entered the turn and whispered to Adam that he wasn't a fan of that move as he sent him to the ground. Adam got back up in sixth, and re-passed his teammate for fifth place, but he couldn't get back up to Hampshire and had to settle for a top five. And I don't think I'm being presumptuous by thinking that Adam is not at all satisfied with that result. I mean, most of these guys will tell you that fifth place isn't where they want to finish, but I think Adam really wanted to prove that this season wasn't going to be the same as the past couple of years. He probably wanted to make a statement that he's more calculated, mature, and ready to win a title, but then the Main Event happened. Now we wait and see how he does next week. Like most people, I wasn't super pumped that we got some rainy weather at the first round of the series. But, it could have been much, much worse. 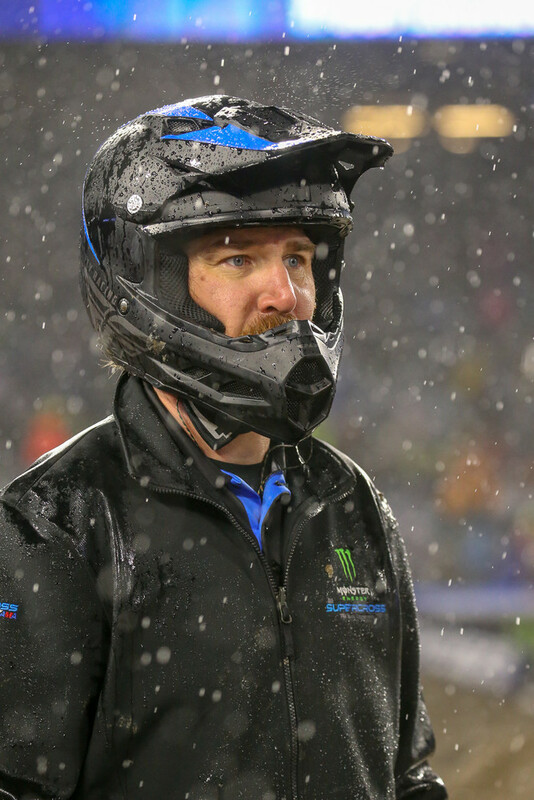 It was raining pretty good by the time the Main Events rolled around which meant a slick track, gnarly ruts, and vision issues for some guys, but the racing was still solid with all things considered. Hell, a lot of the guys in both classes were still pulling some big lines in the rhythm sections throughout the Main Events. I'm just glad that it wasn't an all-out mudder, where the riders are more concerned about surviving the race than actually racing. We got to see some decent action, and while there were some unexpected shake-ups in both classes, no big names had to take a DNF because of the weather. So in the end, it wasn't too bad. Plus, we know for a fact that we'll have a dry race next week since the stadium in Glendale is a dome. I don't think I'd classify this as a great start to the season for Sean Cantrell. Granted, he got a horrendous start in the Main Event and the weather probably led to some issues for the guys in the back of the pack, so I can't proclaim that the world is ending for #40 after one bad race. But after having a solid season in the East Coast division last year, I think there are higher expectations for him this year. I'm not saying he's expected to win, but top 10s should be a given for him. We'll have to see how he fares next week. 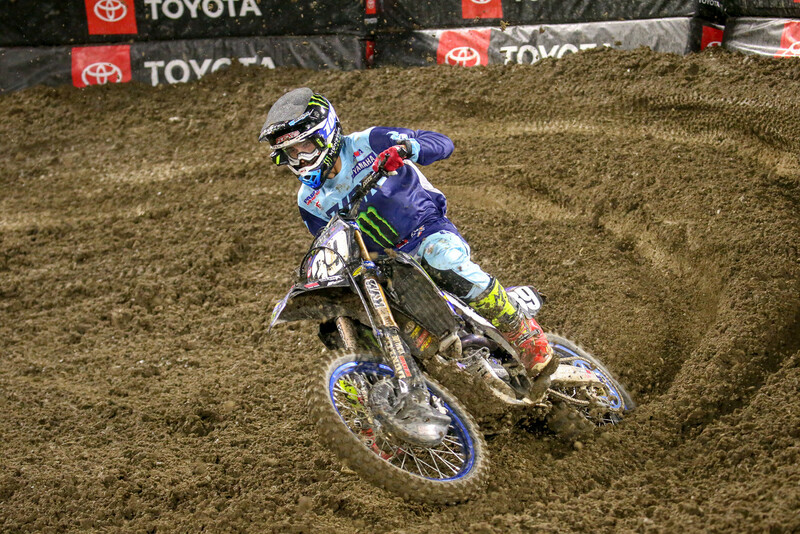 Given the weather, I don't think that Justin Barcia winning Anaheim 1 is the biggest surprise of all time. He has been known to be great in the rain and mud. But, it was still a surprise and a huge deal for him to win the first race of the season. This was also his first Supercross win since 2013. And while that feels like it was three days ago, it was actually almost six years ago. I think that his story has officially reached movie status. I know I have mentioned it previously, but now we have not only have the fall from factory rider to privateer, and rise from privateer to factory rider, but also his first win in six years and the red plate...what a wild ride he's been on. I'm not sure if he'll be able to hang onto the points lead as we progress through the season, but I can't say that I'd be surprised if he does. Assuming everyone stays healthy, this 450 Championship battle will be very interesting to watch. Yeah, Justin Barcia won with Ken Roczen and Eli Tomac rounding out the podium, but Dean Wilson and Malcolm Stewart led everyone around the track for the first 15 minutes or so of the race. Dean looked absolutely fantastic early on. He was hitting all of the big lines and looked very smooth while doing it. Then, Malcolm started to turn up the heat around the mid-point of the race. It looked like he might even go for the pass on Dean, before sliding out and going down. Malcolm would slip back to seventh place after his tip-over, and Dean would eventually relinquish the lead to Justin Barcia before sliding back to fourth place, but it was still a hell of a performance by these two. For Dean, it provides him with the first piece of evidence that a factory team should have given him a full contract for this year. And for Malcolm, it shows that he has gotten serious about his fitness. 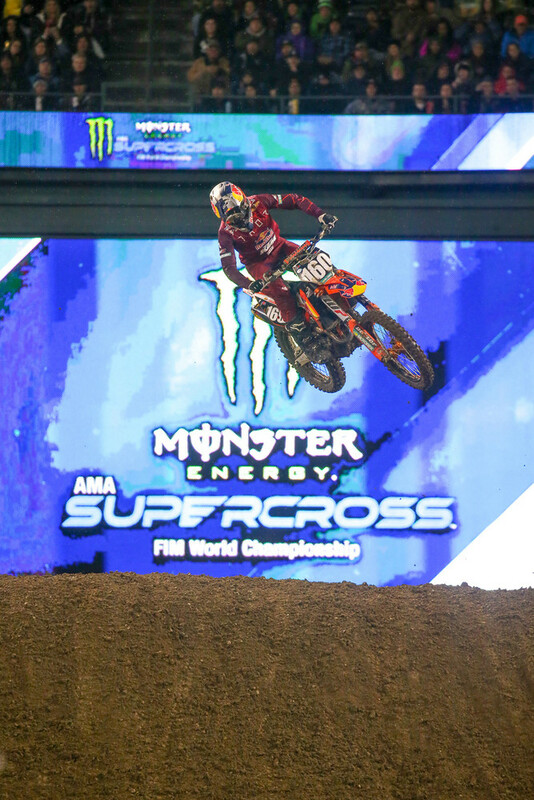 We all knew he was fast on a 450, but he really seemed to struggle with his fitness these past couple of years and while he'd do great in heat races...he'd often drop the anchor about halfway through the Main Event. Could this be the turning point in Malcolm's career? If he continues to put in rides like this, I think so. I don't think Marvin will be too torn up over finishing eighth at the opener. He has only been on the bike for a week or two, and the race conditions were not that great. He was pretty low key the entire day, too. He never lit up the board in qualifying, and he didn't look to be riding for the win or anything. I think that he's simply in salvage mode right now. He knows that he's not quite back to 100% yet, so his best bet is to stay safe and walk away with some points at every round until he's ready to contend for wins again. The #25 will be back to his winning ways sometime this season, and probably sooner than we expect. Oof. That, uh...wasn't good? I'm not exactly sure what was wrong with Jason Anderson for most of the night. He looked fine during timed qualifying, but he looked all kinds of uncomfortable during his heat race and then his Main Event was a bonafide train wreck. I believe that he decided to go with tear-offs for the Main Event instead of roll-offs, which I would assume played a big part in his struggles as it looked like he was already wiping his goggles with his wrist pretty early in the race. But even if you take away the goggle problem, he just didn't look good out there. He gave up positions throughout the night without much of a fight and didn't look to be riding with any fire in his belly. Maybe he couldn't find a bike setup that worked very well in the challenging conditions, or maybe the red number one plate weighed a little more heavily on his mind than he expected, but we'll never really know what was going on with him. Of course, this isn't the first time the defending champion has struggled at Anaheim 1, with the most recent example being Ryan Villopoto in 2013 (where he finished 16th, but he still went on to win the title). So I don't think that this necessarily spells disaster for Jason's season, but if he continues to struggle throughout the next three or four rounds of the series...it may be time to worry. And Harrison is a "Ugly bonus"
Did his bike even make the first turn once all day.? That Garnel(sp?) guy going from C practice to the Main event is a Good bonus.